The Arched Fitz Roy Bear Uprisal Crew Sweatshirt is made from heavier-weight recycled cotton/postconsumer recycled polyester/spandex fleece fabric with a brushed back for cozy warmth next-to-skin. Classic crewneck pullover styling with a regular fit and just enough stretch. 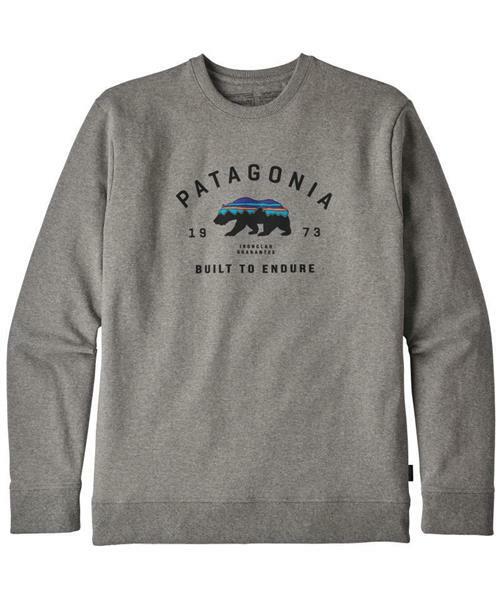 Patagonia original art inspired by a Lance Rea design is screen-printed using PVC- and phthalate-free inks. Fair Trade Certified™ sewn.